This Amigurumi Hat is a quick and easy addition to any crochet toy. Using the hook and yarn specified, the little hat will work up to 3.5 cm high with a 3.5 cm diameter (1.5″ x 1.5″). It takes less than 10 minutes to make and you need only a few yards of yarn. Can’t think of anything you’d like to stick a hat on? Why not use these hats as traffic cones instead? A bit of a bizarre suggestion, I know, but my boys have plenty of crochet cars, so why not! This amigurumi hat is worked in a spiral. At the end of each round, don’t join to the first st with a sl st. Just continue around, making the first st of the round in the first st of the previous round. At this point your hat is just a cone (photo below left). Turn the last row up so that it forms a lip around the bottom of the cone (middle and right photos below). Sew it into place using the final tail of yarn. The best way to do this is to make running stitches in the valley formed by the lip of the hat, working through the stitches of the head below. What would you stick a tiny amigurumi hat on? 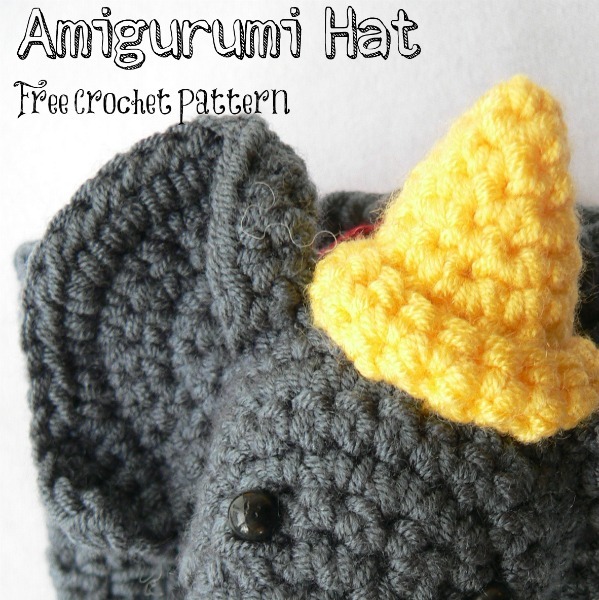 have you got the pattern for the cute elephant you made the hat for? Love it! Thanks a lot for sharing your talent with us. Angelica, these hats are tiny amigurumi hats for tiny little animal toys. Glad you like them, though. thank you so much for such a cute elephant pattern and it was fun following along. Enjoyed Merry Christmas and I look forward to another project. Thank you, Lin. Merry Christmas to you too!